The site of the Valentine's Day Massacre is now only the lawn of a nursing home. 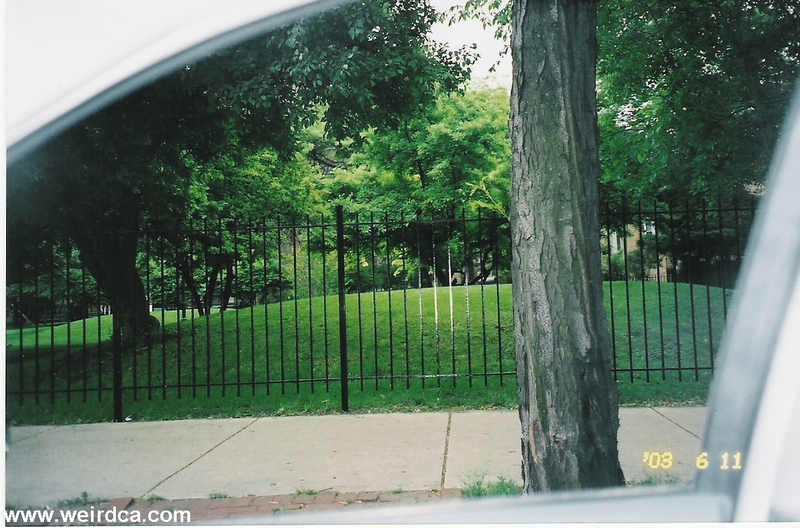 Although now only the lawn of a nursing home, this fenced in grassy spot on Clark Street in Chicago currently just contains some trees. But on this spot on February 14, 1929, several individuals entered a garage where several of Bugs Moran's men were hanging out waiting for a supposed shipment of alcohol. Two of these individuals were dressed as policemen. They lined up the seven men inside the garage along a brick wall near the back of the building. The middle tree on the lawn is supposedly planted where this brick wall was. Then two other individuals came in with Tommy guns and machine gun fire erupted gunning down all seven in the Saint Valentine's Day Massacre. Set up, Bugs Moran and his men had been waiting for a shipment of alcohol that never arrived. Instead of alcohol, Al Capone sent over several of his men, two dressed as police officers (even in a police car). The police hassled the seven inside and had them line up facing a brick wall. Upon doing so, two other men came in with Tommy guns and executed every single one of them. As the men left, since they were in the company of two uniformed "police officers" those observing the incident assumed that everything was under control already, thus delaying the police's reaction time to the massacre. Since Bugs Moran was late to the meeting, he lived, although his gang was forever shattered after that, thus ending the brutal war that was started by O'Banion and his racial slurs. After this brutal incident, the public and police decided they had had enough, and Eliot Ness was soon brought in to solve the crime problem. The location underwent several changes over the years, ranging from an antique store to a club, until the entire building was torn down in 1967. However, the entire bullet-ridden brick wall consisting of 414 bricks was taken down, numbered and acquired by George Patey. There are several rumors about what George Patey did with the bricks. One report had the brick wall displayed in a wax museum with wax mobsters brandishing guns. Another has it touring shopping malls. Finally it was supposedly put up in the men's restroom of a nightclub in Vancouver, British Columbia. Patey had it covered in Plexiglas in order to protect it, complete with targets painted on the Plexiglas for the club's guests to target as they urinated. However, in 1999, George Patey began selling the wall off brick by brick. A few dozen were sold off to private collectors. On December 26th, 2004, Patey passed away and left the wall to his niece. She eventually sold the remaining bricks to the Mob Museum in Las Vegas which nicely opened on February 14th, 2012, eighty-three years after the Saint Valentine's Day Massacre. The Mob Museum has 323 bricks on display with an additional seven in storage. It is located on the third floor of the museum and stands six feet by ten feet. Legend, however, states that those individual bricks which were sold off to private collectors brought bad luck and even occasionally death to those who own them. The location of the original garage where the Saint Valentine's Day Massacre occurred is now simply the side lawn and parking lot of a large nursing home. People are said to occasionally hear screams and machine gun far emanate from the lawn and the entire area is said to spook animals and cause people to feel uneasy. Is the area haunted with the ghosts of the seven killed there? Are the bricks still cursed, bringing misfortune to their owners? Parking was limited in the area of the nursing home in Chicago, so I had to pull up to a traffic light near the location and snap a quick picture from my rental car. As a side note, further south along the street, at the site of the Clark Street Bridge in 1915, 812 people died when the ship the Eastland capsized. Ghostly phenomenon still occurs at this site including spectral screams echoing from beneath the bridge.